*Choose your die-cut top color. *Choose your baked enamel aluminum wrap color on vertical and horizontal posts. Clear Anodized is the default color. (OPTIONAL) Clearance/Alert bar, choose background color. (OPTIONAL) Complete assembly of Galvanized J-Anchors 3/4” in Diameter x 24” L. Bolted to CNC cut heavy plastic pattern which matches the alumi- num foot plate of the structure. Makes installation much easier. (OPTIONAL) Base plate cover baked enamel aluminum 12” W x 12” H x 8” D.
(OPTIONAL) Base plate cover baked enamel aluminum 12” W x 12” H x 8” D. Choose a color below. This aesthetically pleasing clearance structure has an illuminated curved top that matches our canopy curve. This structure is also a great way to promote asmooth traffic flow if you have multiple types ofwashes and want to identify each lane. Ex. Soft touch lane and friction lane. 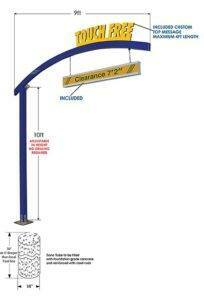 Horizontal curved beam is 2” x 4” x 108”W. 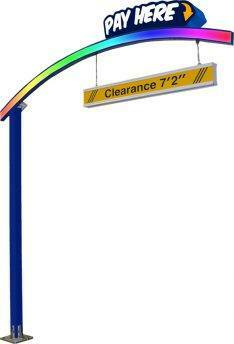 Vertical post is 4” x 4” x 120” H.
Heavy aluminum, comes in two easy to assemble pieces. 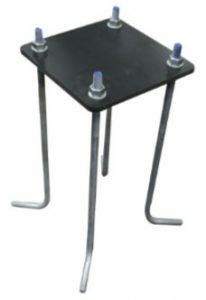 11-3/4” x 11-3/4” x 3/4” heavy mounting plate.